Decoy Open winner Simon Godfrey. The Decoy Over 55s match on a Friday is once again starting to attract a good turnout of anglers and the field remains very strong. In the latest match on the Oak Pool the lake fished tough for most but a few found some fish willing to feed, usually on long pole and pellet shallow as fish were cruising and not really feeding. Out in front was Bob Fairs, who fished the long pole with pellet approach and caught steadily all day from peg 18 to finish with 149lb 9oz. Runner-up on peg 16 was Ray Torrington, who fished similar tactics to the winner for 135lb 5oz, then came Ted Rowe on 132lb 2oz. In the Decoy Lakes Saturday Open it was Jimmy Brooks setting the pace with a fine 171lb 3oz from the Elm Pool. Haddon Lodge winner Lucio Melillo Junior. Like most anglers at the fishery, he caught well up in the water, taking a few better fish close in late in the match. It was much the same for runner-up Sean Coaton, who put 154lb 12oz to the scales. Then came Kevin Wadge with 120lb 15oz. The Sunday Open saw more in attendance so the Horseshoe and Lou’s pools were brought into action. The top two came from the Horseshoe with Simon Godfrey way out in front putting a massive 274lb 9oz to the scales. Fishing a long pole line at 14 metres feeding and fishing pellet, the Whittlesey rod caught well throughout the match fishing up in the water, although he did come close in late on to top his winning weight up with some big fish in the last hour. Runner-up on Horseshoe 17 was Graham Welton. The RAF man found fish feeding well close to the lily pads but it was the open water part of his swim that was the more productive, taking fish on banded pellet to weigh in 184lb 13oz. Barry Mason came in third. He was top rod on Lou’s Lake with 174lb 6oz. On Sunday, Ramsey AS fished the Oak Pool at Decoy and with just a little extra room the leading anglers found a lot of fish willing to feed. Leading the way with a huge 262lb 10oz was Josh Pace. He caught close in with sweetcorn all day netting carp to 8lb. John Price took the runner-up spot. 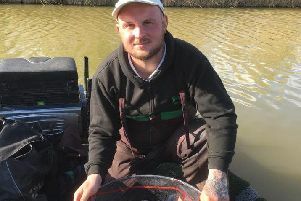 He fished a short pole line with pellet for 142lb, then came Andrew Rayment on 129lb 8oz. Many anglers that fish Decoy Lakes still regard the Beastie Pool as the best venue on the complex, indeed some would say one of the best in the country when it’s on form. And it certainly looks like it’s running into top form judging by the weights taken in the latest JVAC match. Winner from peg 26 was Ron Cuthbert, who caught barbel all day feeding and fishing red maggot to weigh in 146lb 4oz. Then came Jim Wilmot, who weighed in 141lb fishing similar tactics to the winner. Guy Dew came third fishing a chopped worm and caster approach for 139lb 8oz. Haddon Lodge is starting to show some much-improved form of late. Leading the way in the latest match was Lucio Melillo Junior. He drew peg 13 and caught a net of skimmers and carp up in the water on big pellets for 35lb 8oz. Second was dad Lucio Senior with 24lb 7oz, then came Martin Harwood with 21lb 9oz. Wagtail Pool fished well for the Conservative Club’s latest match at Float Fish Farm Fishery. Andy Fielding took the top spot with 82lb 14oz. He alternated between the pole and small feeder. Runner-up was Bob Walker, who fished hard pellet at full depth putting 76lb 12oz to the scales, then came John Parnell fishing a pellet waggler for most of the day to weigh in 58lb 12oz. Webb’s AC fished Kingsland Fishery on the Small Carp Lake last weekend and leading the way with 85lb 3oz, was Marcus Webb. He caught on a small feeder with pellet. Runner-up alternating between the feeder and pole was Ken Matthews with 74lb 8oz, then came John Crouch with 72lb 15oz. It would seem the Over 55 matches around the area have become very popular of late. A really good turnout at Float Fish Farm Fishery last week saw the Two Islands all but full. Rick Tweddle won it from peg 34. He caught on the pole and feeder putting 121lb 12oz to the scales. Runner-up Dave Keech had 116lb 6oz from peg 30, caught on the feeder, then came Danny Carlton with 95lb from peg 20.